Our newspapers are distributed by mail and news racks in Blanco, Burnet, Comal, Gillespie, Kendall, Kimble, Lampasas, Llano, Mason, McCulloch, Menard, Mills, and San Saba counties. We also publish special sections throughout the year, in addition to regular weekly issues of the newspapers, which cover such areas as Sports, Hunting, Christmas Holiday, Farming/Ranching, and Community Events. 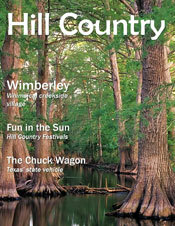 Our very popular Spring and Fall sections are published annually, with several thousand distributed free of charge around the community to help inform visitors about attractions and local businesses. Texas Hill Country Magazine includes articles on real people and businesses in this region and the stories behind them — capturing what makes Texans so unique. Our readers include all ages and are from all around Texas and the United States; they love the Hill Country and want to explore its attractions. Our readers are characterized by a high level of education, and have the time and means to take advantage of this region's attractions. Advertising rates, as well as a complete schedule of special sections, are available by contacting an advertising representative.